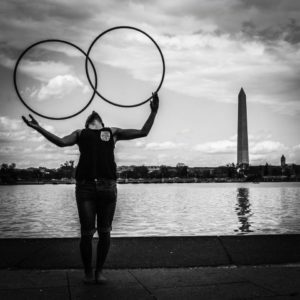 *This workshop is considered an intermediate level workshop, although anyone from a complete beginner to an experienced hooper can be sure to pick up new moves, concepts, and transitions to add to their flow! Basic foundation moves for this workshop will include basic wedgies, escalators, and chest rolls. *The first 90 minutes will focus on on body coinflips. We will start with basic arm spins, and work our way towards elbow, leg, neck, and shoulder coinflips. Some coinflip rolls will be included in this portion of the workshop. We will also go over flashy combinations, tricks, and transitions to spice up your flow! *The second 90 minutes will focus on off body coinflips. We will start with floor work then work our way up to more advanced tricks that involve coinflip tosses and palm/hand spins into wedgie and escalator moves. These moves will build from what we learned in the on body coinflip section of the workshop. – This workshop caps out at 40 attendees! -Tickets can be purchased at the Eventbrite link for $40 or for $50 at the door! – Tickets are also non refundable, but can be transferred to another person!